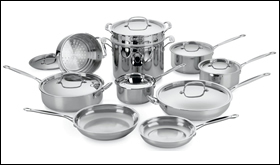 Cuisinart cookware is loved by cooks, especially because of how little it costs. Cuisinart makes a very full line of cookware. Known for making just about every kind of kitchen appliance, they also make excellent cookware that rivals the most premium of brands, but for a more modest price. Julia Child and James Beard popularized the Cuisinart food processor. Under management from Conair Corp., Cuisinart continues to innovate in the kitchen. 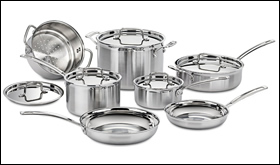 Cuisinart MultiClad Pro cookware rivals All-Clad stainless steel cookware in quality but is offered at a much lower price. GreenGourmet is their eco-friends and PFOA-free nonstick cookware. It comes in both stainless steel, as shown in the dashboard below, and in hard anodized aluminum. Lastly, we cover the Cuisinart Chefs Classic cookware. It comes in stainless steel, as shown below, hard anodized aluminum and in cast iron. Cuisinart makes excellent cookware. They are nearly as good as the top-of-the-line brands, but at a much better price. Their Multiclad Pro and GreenGourmet lines are definitely worth consideration. 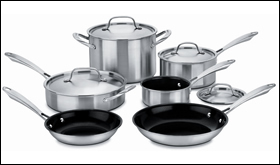 Cuisinart MultiClad Pro cookware is excellent stainless steel cookware at a fantastic price. It is near All-Clad quality.